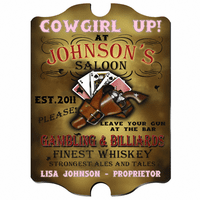 FEATURES/SPECS Turn your man cave or game room into an old west saloon with this Cowboy Up personalized bar sign. Made of solid wood, it has rustic looking poster print artwork that has a holstered gun front and center. It implores visitors to leave their guns at the bar and promises gambling and billiards, finest whiskey and the strongest ales and tales. 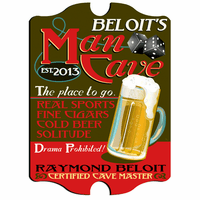 Add your name as the proprietor of your own old west saloon and a year of establishment. 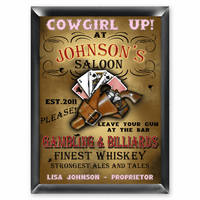 This custom printed Cowboy Up bar sign is an ideal housewarming gift or present for a buddy with a new man cave. Comes painted with the words "Cowboy Up"
Cowboy up for an ol Cowbot. It hangs next to my bar and could not be a better fit. Smiles all around. 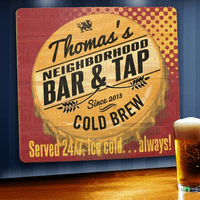 The best is "leave your guns at the bar" Now they is no room for beer bottles. ProsIf you have a "western" d�cor or want to start one- get one of these personalized offerings.